Within as little as two weeks of feeding Farrier's Formula® one should see a glossy, more deeply colored coat. By nine to ten weeks a new band of strong, healthy growth will be clearly visible at the coronary band, and the difference in the structure of the hom in the periople can be seen with the naked eye. Internal benefits, while more difficult to see, are just as dramatic. 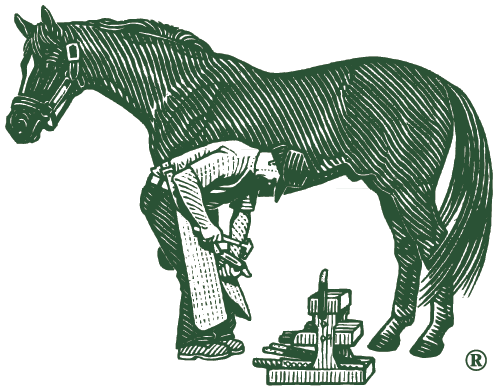 The length of time Farrier's Formula® should be given at the replenishment level is determined by the initial problem to be solved. If the goal is to improve health and appearance of the skin and hair, replenishment level should be continued for approximately one to two months. If the goal is to grow a long and flowing healthy mane and tail, the replenishment level should be fed until the mane and tail reach the desired length. The time required to completely remodel the wall, sole, and frog of the foot is approximately 9-12 months. Therefore, it is best to continue at the replenishment level until the foot is completely remodeled even though one will begin to see some difference in the hoof within two months. In the above cases, once desired results are obtained, usually the feeding amount can be reduced by one half in order to maintain the desired condition. Each horse will be somewhat different. For example, some thoroughbreds and warm bloods may require the replenishment level continuously. Arabians and Arabian crosses may sometimes be maintained on 1/2 cup per day. It is important to keep all horses on a maintenance level to maintain good hoof health. Usually the same thing (genetic, environmental, and management factors) that caused the problem in the beginning will be present throughout the horse's life. If one does not see the beginning of the expected results after feeding Farrier's Formula® for a period of eight to ten weeks, the indication is that other factors can be involved in addition to nutrition. The additional problems could include genetics, environmental, and management. In the interest of solving the problems in a timely manner, Life Data Labs should be contacted immediately to speak with our nutrition consultants in order to determine a course of action. Satisfied customers worldwide report up to a 25% improvement in feed efficiency after feeding Farrier's Formula®. This is likely due to better digestion and utilization of the feedstuff resulting from the nutrients in Farrier's Formula®.